No sunsets are more beautiful than those from Tell Mieh-Mieh - so said a poet once imprisoned in the British jail on the western heights of our town. The poet Munif Moussa, my father's cousin, told me this quote over tea in my uncle's house. 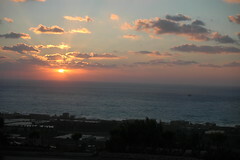 Dad took this picture in September, 2005, on his last visit to Lebanon. He loved photos of sunsets and other gorgeous landscapes. This is the obituary my mother placed in the SF Chronicle for October 5, 2006: Elias Abu-Saba. In reply to my question about identity between Lebanon and the USA, he recited to us a lovely poem he wrote about that, which I still circulate to people in the same dilemma. He talks passionately about his love and longing for the homeland, with all its shortcomings, and contrasts that with wanting to be with his grandchildren, and about the better roads and rule of law in the US. Mr. Abdullah kindly sent a PDF of the poem, which you can view here. It's in Arabic, and written by hand. I can barely read it because I am so illiterate in Arabic, but I can tell that it has lines that say "Here I have a house, there I have" some other noun. "Here I have mountains, there I have...", and so forth. If any of my Arabic-literate readers can make out this poem and care to translate or summarize, please be my guest. I have no way of telling whether it's a good poem or not, but it resonates for Mr. Abdullah, who only met my father once. Thank you so much, Ghassan Abdallah, for sharing this with us. It means so much to me to know that a stranger treasures Dad's poetry, and circulates it among his friends. And you are from Palestine, moreover. My father would be so happy. Please join my mother, brother and me in the church hall for light refreshments afterward. My father's brother Simaan organized a memorial service at our church in Mieh-Mieh, today, October 1. I received reports from several relatives showing how the service reflected my father's true nature. First of all, on Friday when the village received the news, the church rang its bells in a distinct, slow cadence to mark the death of one of the parish. Cousin Camille was on the phone from Qatar to his sister in Mieh-Mieh at the moment, heard the bells, and was deeply affected. My uncle wrote a Naawa, or obituary, which the church or mayor sent to all the neighboring villages, including Muslim ones, we think. Each Christian town in the area rang their bells, and announced the time of the service. Some of the towns include Maghdoushi, Darb El Sim, Qrayi, Ein El Delb, Abra, and many more. On Saturday, there was a steady stream of villagers to Uncle Simaan’s house bringing their condolences. The memorial Service for Elias was done by Bishop Salim Ghazal, deputy Patriarch of the Melkite Catholic church and abbot of Deir MKhalles (monastery), assisted by father Hani Francis (a Mieh W Mieh priest now living and working in Sydney, on a visit home), and Father Sassin, the current village church priest. My cousin Nabil writes: "Father Salim (Ghazal), as we know him, was the priest of Mieh w Mieh during the 1960's and 1970's. He comes from Mashgarah in the Becca valley, but the city of Sidon and its surroundings became his adopted region. He is one of the most progressive priests I have ever met, with proven record in support of social justice, equality and tolerance." Update: Some added passages about how he helped students make it in this country, and about his love of cooking for a crowd. 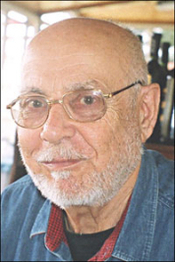 Elias Abu-Saba lived the values I hope to promote in this blog: mutual tolerance, social justice, and concern for the earth. He wanted to see those values embodied in Lebanon, his beloved homeland, as well as in America, his adopted country. Because many people in Lebanon and around the world read Dove's Eye View, I am going to tell you some important things you must know about him. Dad was born into a poor farming family in a small village named Mieh-Mieh, outside of Sidon, south of Beirut. We all say they were poor, but his father owned many dunums of fertile arable land: olive orchards, orange groves, fields in the flats good for wheat and lentils. Elias' humble origins shaped his consciousness for the rest of his life. He insisted on breaking down barriers between classes; he clung to his connection to the soil and to farming. He urged working-class and immigrant students to better themselves, and he refused to see the many rich and powerful people he met as his superiors. My father died today, Thursday, September 28, 2006, at 2:35 p.m. California time. His release was merciful and he died surrounded by his wife and children. Where the wings have failed. Rocking fearlessly in the unknown. My father is failing rapidly. Those of you who are praying, please ask for his release. He is suffering and he needs respite. Thank you. 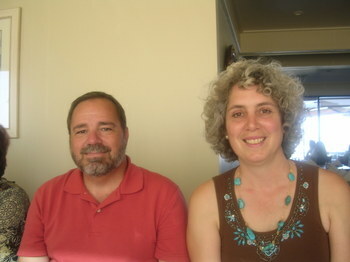 Randy Bayne, of California Notes, and me at lunch with the relatives. Saturday, Sept. 22, Alameda, Ca. We are second cousins, and share two great-grandparents. My parents hosted a family reunion this past week for my mother's siblings. The Bayne cousins of California also showed up, as well as some Bentleys from Los Angeles. My father insisted that he wanted to do this party, despite his illness, so we did. On Friday night, Karen Bentley and Ian Dogole performed in honor of Dad and Aunt Susan. Dad read poetry to improvised music. Dad has performed with Karen and Ian several times over the years, and we are so grateful he got to do this for an audience of about fifty friends and relations. It was an exhilarating night. Khalil reads Dad a "jazz poem" he wrote in his honor. At a restaurant the next day, Dad writes a poem on a paper menu - the classic Elias gesture, a poem composed on a napkin, styrofoam cup, or menu, in the middle of a party (or anywhere). If you are a friend or family member and care to see more pictures, email me for the flickr link. (Or be crafty and google it). I am sorry to tell you that Dad is not doing all that well. Thank you everyone for all your kind messages. My father's condition is worsening. He is comfortable but heavily medicated. His hope is to travel to Lebanon to die and we are exploring this possibility; his condition may not warrant travel under any circumstances. People are still commenting on the Islam posts below. Some of these comments are just mean-spirited and ugly. Those of you who have already made such comments are not being banned, but please note that I won't read what you have to say. If you cannot speak in the spirit of Jesus, in the spirit of Mohammed, in the spirit of the Jewish prophets who exhort us to love one another and be kind, then I won't shut you up but I won't bother to listen. I may post here and there in the coming days. I may comment. But I may not. I have other things to do. Your prayers and good wishes will be much appreciated. If I know you, I will read your messages.